There are certain home improvement tasks that you can do yourself, such as mowing the lawn or painting. However, for larger jobs that require specialized equipment, a special skill set, or a lot of time, it may be best to let professional contractors handle the job. Is a general contractor worth it? The role of a contractor is to oversee a project. Many have their own crew of workers, some of whom have specialized skills, but others bring together the people needed to complete the project and add a mark-up percentage to the total cost of the sub-contractors. Contractors help to ensure that the project is done well, economically, and quickly. But even with a good general contractor, the project can be costly, stressful, and involve unpleasant surprises, such as damaged materials, burst pipes, or dangerous wiring. 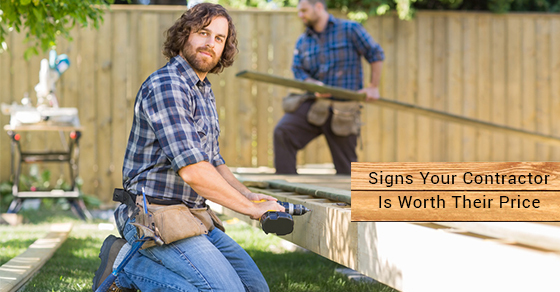 It is hard to determine if the contractor you’re hiring is good enough, but there are few things that can help guide you in the right direction. Renovations and other types of home improvement projects can be expensive. Before you entrust your home to a contractor, you should research them and the clients they have worked with before, in order to determine if they were satisfied with the job. Alternatively, you can ask your friends in the neighborhood, co-workers, or relatives who have done similar projects for references. You can also ask employees of local hardware stores, or people you know in the building trades, to provide referrals. The best contractors in the industry should ideally be busy when you contact them to discuss your project. During the survey and negotiations, they should be working on another project – which you can evaluate yourself to check their quality of work – so they won’t be able to begin your project right away. It is usually more expensive to sub-contract a project, because the subcontractors have their own cost of labor, and the general contractor will mark it up to make some money too. If you work directly with the subcontractor, you will be able to save yourself 10 – 15 percent of the total cost that would otherwise go to the general contractor. Contractor agreements in Canada should be detailed enough, indicating exactly what will be done, including payment schedules, triggers for progress payments, deadlines, exact quantities and type of materials required, and even where the materials will be sourced. If it is not satisfactory, provide addendums or write up your own. If there are any changes in the project along the way, you can always generate a written change order including the new work, cost, and materials. Finally, a safe contractor is worth it. Contractors with insurance coverage may charge more, but the cover, in addition to your homeowners insurance, will give you peace of mind.